Rosa Cuba cigars are the perfect fusion of tradition and quality. They are concocted from some of the world’s most premium tobaccos, creating a smoking experience unlike any other. Some of these cigars are handcrafted in the classic ‘Cuban sandwich’ style, meaning that the short filler leaves are rolled within the long fillers. A variety of carefully selected Dominican, Nicaraguan and Honduran tobaccos are used to form the filler, while a Nicaraguan binder keeps things together. A glistening Ecuadorian Sumatra-seed wrapper conceals each cigar with a gleaming flourish. A medium to full-bodied smoke is produced by each stogie, and ends with a smooth finish. Hints of spice can be detected due to the Ecuadorian wrapper. The cigars are available in a variety of nine sizes. While the Rosa Cuba Angels is the smallest variety, with a length of 4 ½ and a ring gauge of 38, the Mille Fleurs is the largest size, with a length of 7 and a ring gauge of 48. 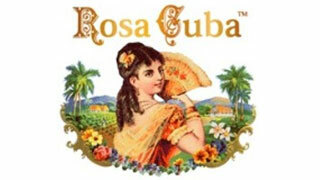 Rosa Cuba cigars are made with great care at the Nicaraguan American Tobacco S.A. in Esteli. This region is known for its rich and fertile soil, which is the perfect environment for producing full-flavored tobacco with a strong body and rich aroma. Besides their high quality ingredients and invigorating flavor notes, these cigars are also offered at an incredible value, making them every frugal cigar connoisseur's best friend. ENJOY THESE WALLET FRIENDLY SMOKES, TRADITIONAL CUBAN STYLE!